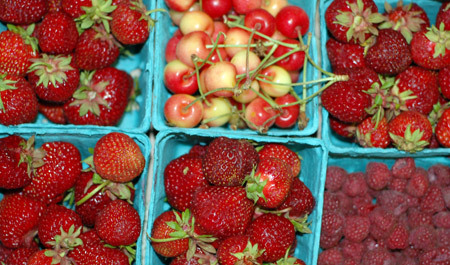 It’s June in Oregon, and that means one thing: strawberries. Their season, and that of cherries, is unmercifully short, so we have to take advantage of it while we can. We went to the Saturday market with Freyja again this week, and came home with a half-flat of juicy little jewels for $15. I got a pint of cherries (which look like Rainiers, but are not as sweet) and a pint of raspberries (which I don’t really care for, but keep trying), but the real treasure was four pints of Hood strawberries. Our introduction to Hoods was two summers back, and once you’ve tried them, no other strawberry ever measures up, in color or sweetness. But once you bring them home, they don’t last more than a day or so fresh. In past years, we’ve sometimes macerated them with sugar and balsamic in order to keep them a few days longer and pour over slices of pound cake. This year, after eating a pint or two right out of the box, I whipped up a fluffy batch of strawberry-sour cream ice cream, pink as bubble gum. I don’t care for store-bought strawberry ice cream, which can be so artificial tasting, but this—from my favorite ice cream book —was something else altogether. Aside from a fleeting wish that I had pureed the sugared strawberries by themselves and strained them before mixing in the heavy and sour creams, it was perfect: just the right level of sweetness, and a pure strawberries-and-cream flavor. It had more overrun than any other homemade ice cream I’ve tried, and matched up perfectly with some cacao nib meringue nests I made a few days before. 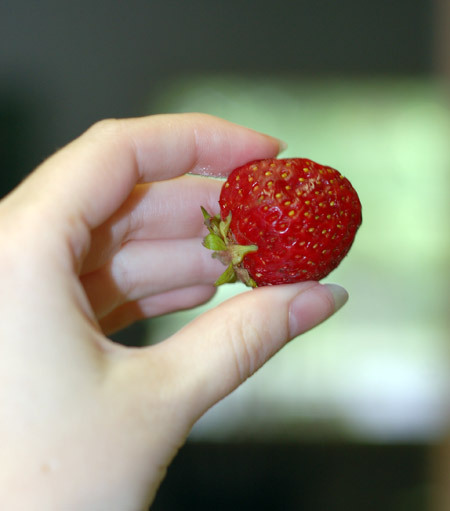 Thank goodness for strawberry season! Source: The Perfect Scoop by David Lebovitz. Update 6/18/07: We had a small scoop of strawberry ice cream as an afternoon refresher after getting back from Silver Creek Falls today. 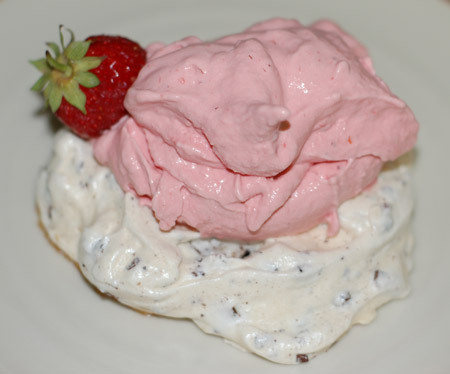 After dinner, Jeremy said that although he’d never much cared for strawberry ice cream in the past, he’d rather have that for dessert than the LifeSource German chocolate brownie or some squares of chocolate that I had suggested. I think that makes us converts! Update 7/10/07: Another batch of this ice cream was called for to commemorate the end of strawberry season 2007. It’s not going to be easy to wait until next year for another batch!